Author Chat with Shawn Sarles (CAMPFIRE), Plus Giveaway! Today we're excited to chat with Shawn Sarles, author of CAMPFIRE. Read on for more about Shawn and his book, an interview, plus a giveaway! Be careful what stories you tell around the campfire... they just might come true. Fans of Scream and Miss Peregrine's Home for Peculiar Children will devour this chilling horror debut. The inspiration for Campfire came from a place of nostalgia. Growing up in the ‘90s, I was obsessed with all things scary. It was kind of a horror hey-day, if you think about it. There was Goosebumps and Are You Afraid of the Dark? Blockbuster was huge. You could stroll through the horror aisle and rent everything from slasher flicks to creature features. Campfire came from my desire to merge these two genres of horror – take some scary stories and set them in a world where you have this unknown killer stalking around in the dark and see who survives. Chelsea. She was my main character’s best friend and a lot of fun to write. I liked that she was snippy and got to have a lot of sassy lines. But then she’s also super loyal to Maddie. A ride-or-die friend…which maybe isn’t the best thing to be in a horror book. You’ll have to read to see if she survives to the end. The title. It just has a nice, ominous sound to it. The last scene. But mostly because that meant I had finished writing a whole book! Any time I get to write “The End” I’m ecstatic. The power of revisions. I’m a perfectionist when it comes to writing, so it takes me an eternity to crawl through that first draft. With Campfire I got to do my first true revision, and I was shocked at how easy it was to go back and fix things. Like, I could just pop in a new line and suddenly there was a new layer of depth added to the character. Or I could take a whole scene out and the story become magically tighter. I’m still a super-slow writer, but having experienced how much you can do in revisions has really helped me when I get stuck. The eyes! Those creepy, fiery eyes are just hypnotizing. Especially when you see the finished books. The shine on that cover – you can’t look away. It’s like some sort of demon. I love it! YABC: What was your favorite book in 2017? I’ll give you two. One YA and one Adult. Next up…that’s a scary question. Well, right now I’m working on a new novel. I have an outline fleshed out, and hopefully I’ll have the first draft finished soon. I don’t want to say too much, but it’s an LGBTQ+ slasher set at a college-prep summer camp with themes of catfishing and birds…I know that’s vague and doesn’t sound like it goes together, but I promise you it does. I'm curious about this one! The cover definitely catches my attention, and it makes me wonder if the "scary" factor will be realistic or spoof quality. The summary is interesting, kind of like one of those ghost stories I heard at sleepovers growing up. The cover is fun and the synopsis sounds amazing! The cover reminds me of the good ol' days when I enjoyed Fear Street and Christopher Pike novels; I still love a good scary story decades later. So I am psyched for this one! 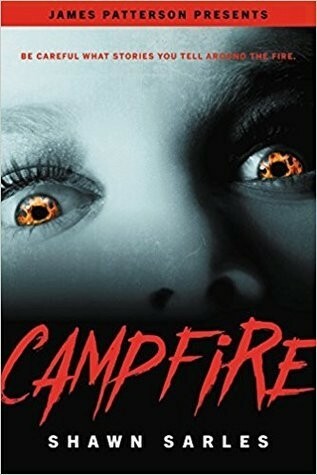 The cover and synopsis totally creep me out, making me really want to read Campfire. The cover is cool and creepy. I think this sounds like a unique horror story. The cover is scary and perfect for this thriller.